Ahead of the next global climate talks in Poland, Prof John Whitelegg, Liverpool John Moores University, argues that major reductions in transport pollution are only achievable if we set our sights beyond electric vehicles and driverless cars. In the recent Budget, the UK government announced huge spending of £29 billion for roads. This comes on the back of a recent rise in the greenhouse gas (GHG) emissions of UK cars – in contrast to falling emissions in most other sectors of the economy. It is clear that the government does not take the issue of pollution from cars seriously enough. The UK is remarkable in its dismissal of best practice in decarbonising land transport, including cars. The performance of the city of Freiburg in southern Germany is a compelling example of what can be achieved. 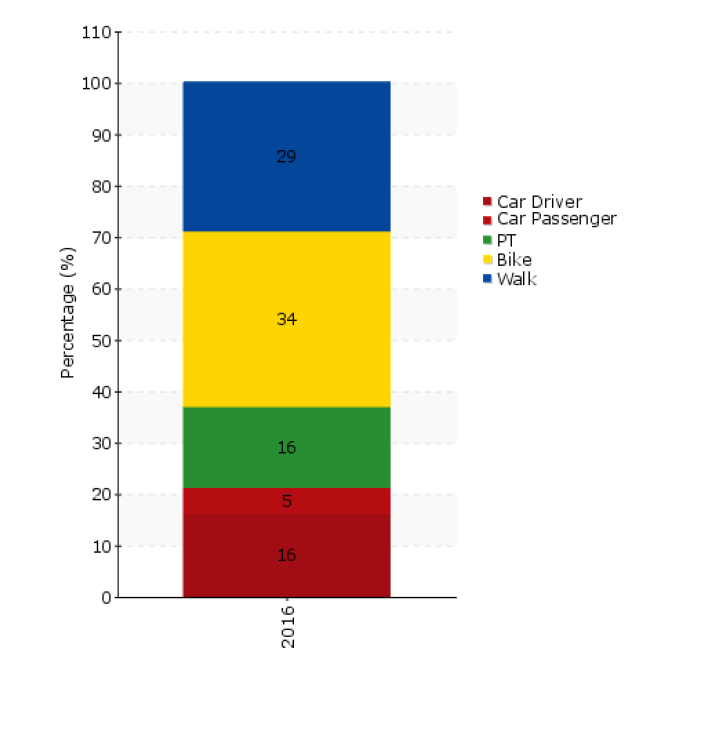 Through a consistent, funded, co-ordinated transport strategy over at least three decades, Freiburg has reduced car use to 21% of all trips every day and increased bike use to 34% (see figure 1). In a typical UK city – e.g. Liverpool – approximately 2% of all trips every day are by bike and approximately 55% by car. Fundamental GHG reduction in the transport sector can only be achieved by modal shift away from the car on the scale already achieved in Freiburg and many other German, Dutch, Swedish and Danish cities. Cars “are often cheaper than public transport”. This is not the case although it is a generally held perception. The total cost of travel by car includes obvious things like fuel but also includes less obvious things that need to be replaced at intervals depending on use, e.g. tyres, brakes, exhaust systems. When all costs that vary by distance travelled are included, a car trip is more expensive than a bus trip. In addition, there is a large literature on externalities. Who is paying for the costs generated by the driver but not paid for by the driver, e.g. damage from GHG emissions, deaths and injuries in road crashes, health impacts from local air pollution? “Car travel is just too attractive”. This may be the case in the UK where we have created a poor quality public transport system and do not fund safe cycling infrastructure at the same level as is normal in Denmark or the Netherlands. The alternatives to car travel are far more attractive than the car in places such as Copenhagen, Berlin, Lund, Oslo, Zurich or rural Switzerland. John Whitelegg is a Visiting Professor, at the School of the Built Environment, Liverpool John Moores University. 5. Whitelegg J (2018). Mobility: A New Urban Design and Transport Planning Philosophy for a Sustainable Future. Amazon Direct Print.